​Your customers will benefit from easy, comfortable cleaning – ensuring that they keep coming back time after time. The new AUTO BOOSTER motor pumps are controlled by a new frequency modulator, adjusting the incoming electrical frequency to the motor unit. As the frequency is adjusted, motor speed is increased or decreased accordingly. As a result of this change in speed, water flow and pressure from the pump are modified by a change in speed of the pistons. 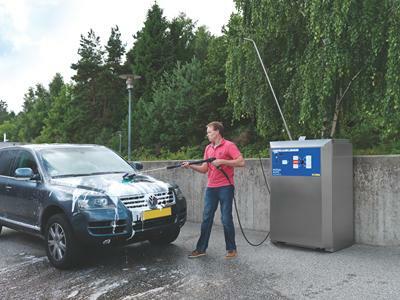 Due to the reduced machine cost and reduced service cost expectations, return on investment for service stations and other investors purchasing and installing these units will be much quicker. The new technology then reduces wear and tear and enables us to implement pumps without additional complex unloader parts. 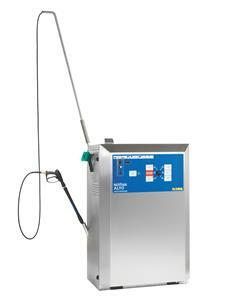 In addition, running at lower frequencies and speeds, motor pumps are much quieter…giving a more comfortable cleaning experience for the user. Fewer parts in the pump : less complex and lower wear and tear/maintenance and higher reliability means less cost for investor and quicker pay-back on investment. New Frost Protection function : based on simply running the motor pump unit very slowly instead of complex system including feeder pump. More reliability, less maintenance and also lower overall electricity and water consumption = lower lifetime cost. Diesel and Electrical heating models available including version with stainless steel coil for higher reliability and less downtime in areas with soft water. New BOOST function with higher performance than standard car cleaning for quicker cleaning of incrusted dirt for example on commercial vehicles. New, adjustable No Scale dosing pump for more accurate protection of the boiler coil against hard water, thus reducing maintenance needs and downtime. Improved selector switch for increased reliability. Flow activated pump control system for added user comfort through lowered forces needed at the spray gun. New water filter solution for improved protection of the pump against poor water quality and thus improved reliability and reduced downtime.